Microfluidic devices were used to study the influences of hydrodynamics of local microenvironments on Staphylococcus epidermidis (S. epidermidis) biofilm formation and the effects of a poly(β-1,6-N-acetyl glucosamine)-hydrolyzing enzyme (dispersin B) and/or an antibiotic (rifampicin) on the detachment of the biofilm. Elongated, monolayered biofilm morphologies were observed at high flow velocity and fluid shear locations whereas large clump-like, multilayered biofilm structures were produced at low flow velocity and fluid shear locations. Upon dispersin B treatment, most of the biofilm was detached from the microchannel surface. However, a trace amount of bacterial cells could not be removed from corner locations most likely due to the insufficient wall shear stress of the fluid at these locations. Dispersin B or rifampicin treatment was effective in delaying the dispersal behavior of bacterial cells, but could not completely remove the biofilm. Combined dynamic delivery of dispersin B and rifampicin was found to be effective for complete removal of the S. epidermidis biofilm. We thank Dr. Dongying Qian, Stevens Institute of Technology for performing the CFD work of device I. 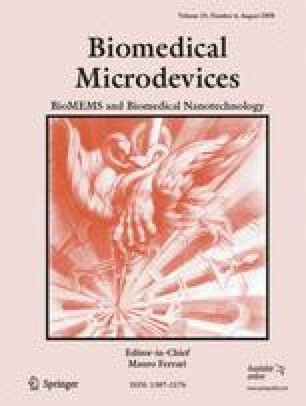 We also acknowledge fabrication of device II by the Stanford Microfluidics Foundry in the Department of Bioengineering, Stanford University, CA.